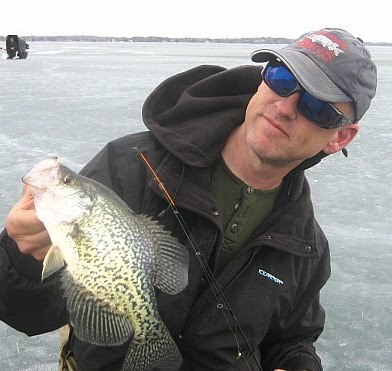 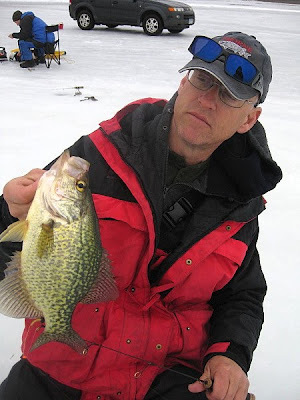 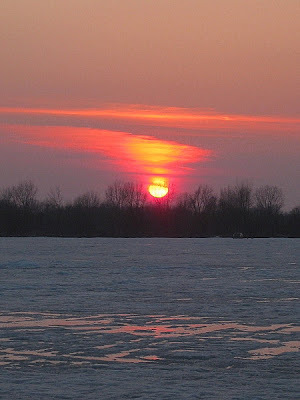 Ice season closer a crappie frenzy! 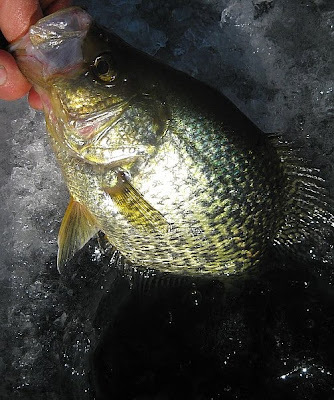 This weekend I was chasin slabs again up in the Alex area, the bite was up shallow , I could see the inside weedline through the ice and drilled a bunch of holes along the edge. 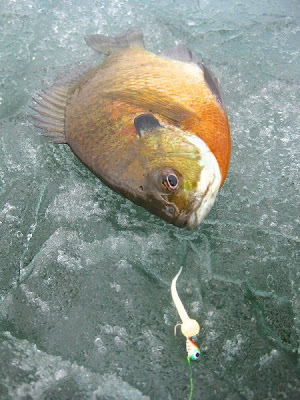 The fish were right umder the ice and willing to bite plastics. 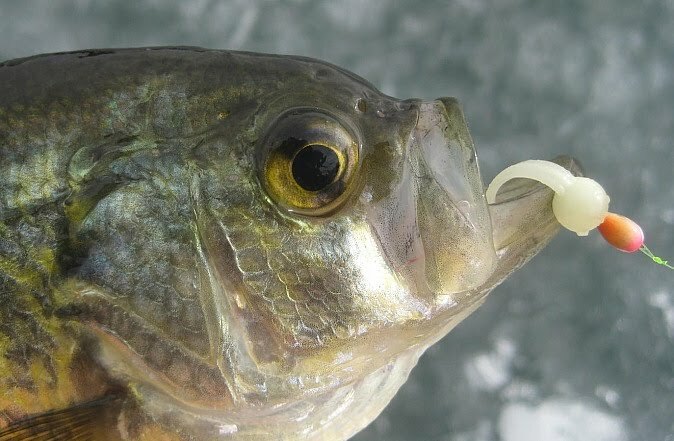 I tried larger power minnows and tubes but they would not take them so I downsized to a 2 mm fiskas with a glow nuggie, and that worked well. 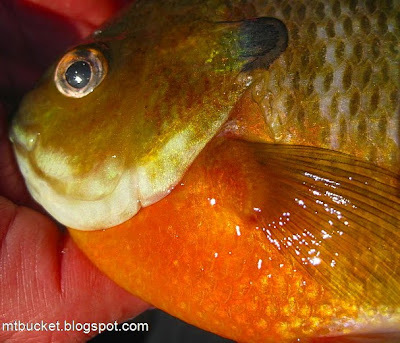 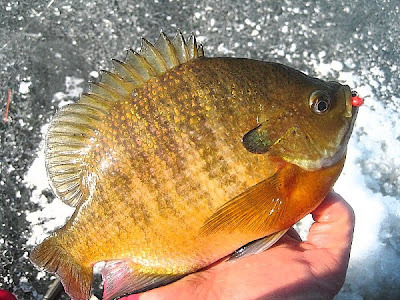 Some did ok with waxies, but they had many small bluegills to contend with. 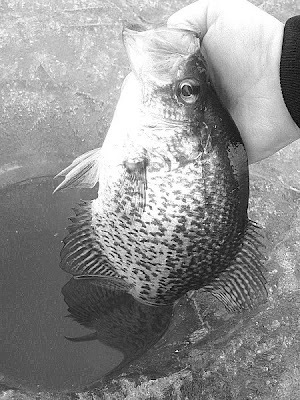 Me and Jack ended up getting over 100 crappies and 'gills. 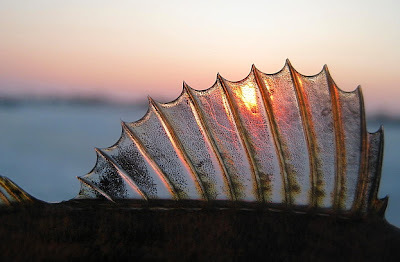 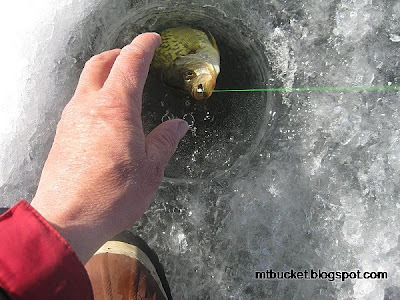 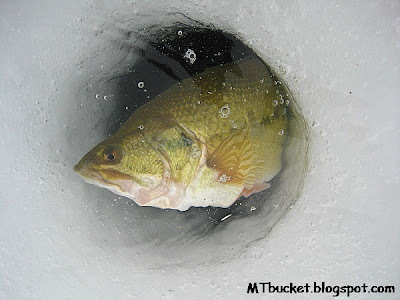 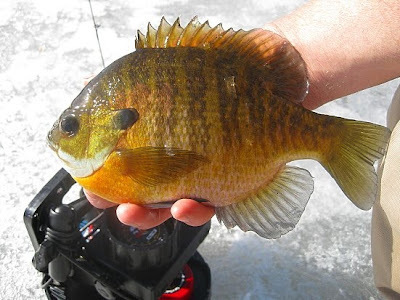 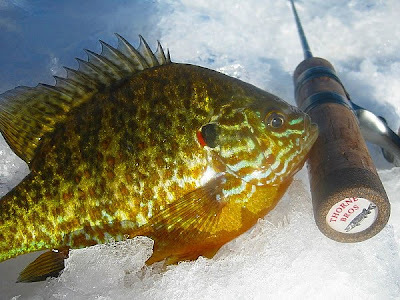 A couple of warm sunny days had me out on the ice to get some panfish action before the ice melts. Saturday during the get together there was lots of crappies scattered on a gradual drop off from 18 to 24 feet. 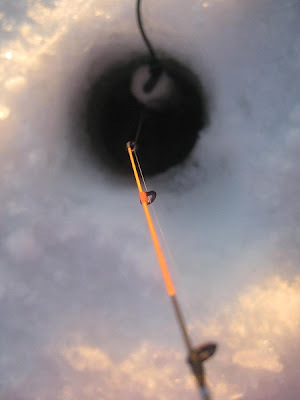 just off a shallow bar. 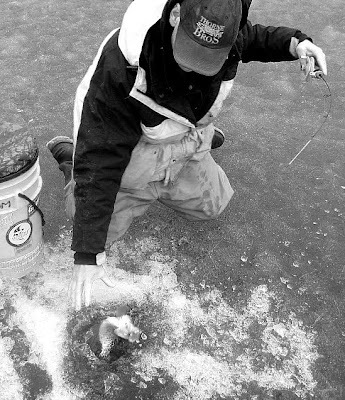 many holes were cut already so I just got to hole hopping marking fish in most of them. 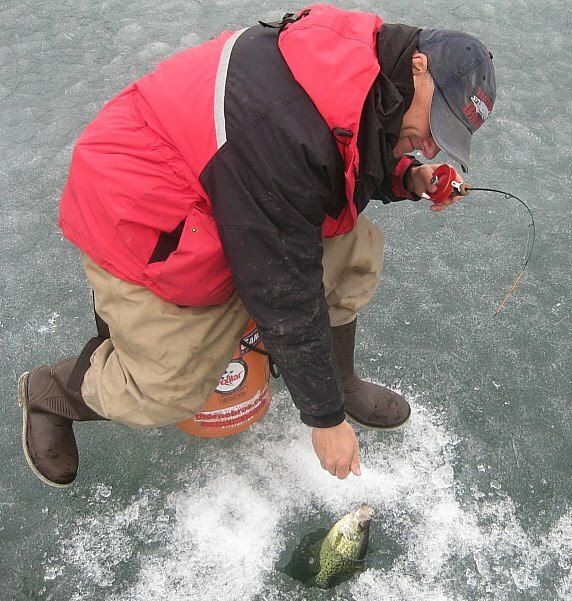 I usually got one out of a hole then I would have to move. 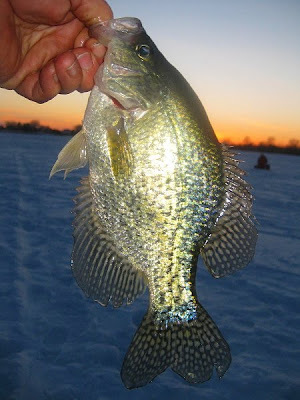 Had to work for them, but caught many nice crappies and a couple of good 'gills and perch along the way. 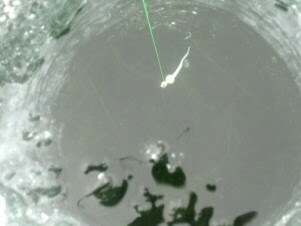 I got my fish on a 4mm fiskas jig in various colors with a glow nuggie with the ball cut off. 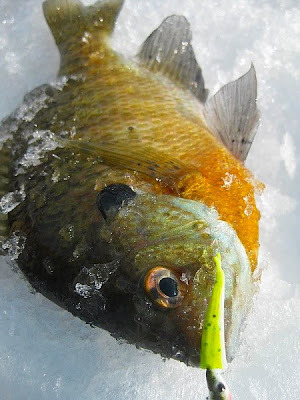 I also tried a new ice line made by cortland that looked yellow in the store, but out in the sun it really glowed bright green making it easy to see. 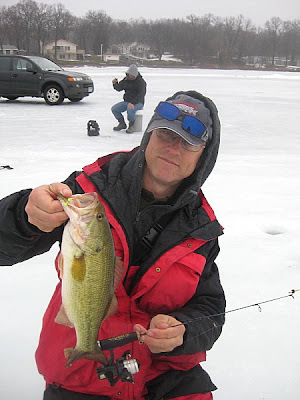 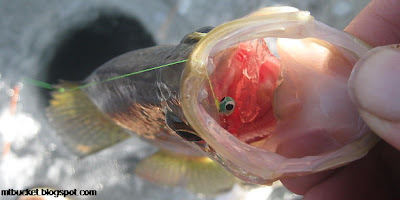 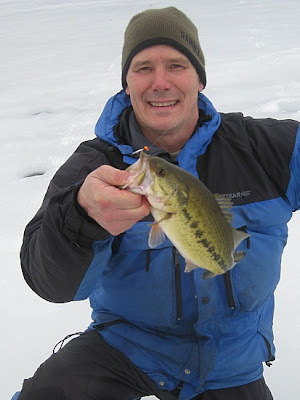 When I got a bite, instead of just setting the hook, I would drop the rod tip toward the hole and with that hi vis line, I could tell right away if I had a fish on, then set the hook. 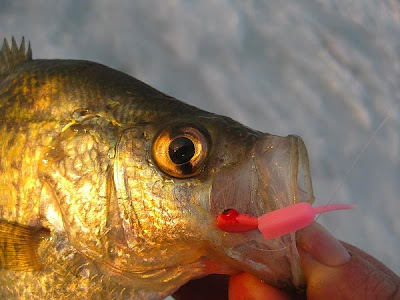 I found I missed a lot less doing this, and they would be hooked deeper in the mouth instead of on the tip of the lip, making it harder for them to escape. 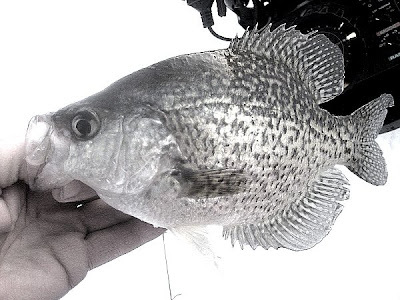 Sunday found a few of us fishing a small 26 ft depression out near the mouth of a creek. The fish were there pretty thick for a couple of hours and were biting pretty hard. 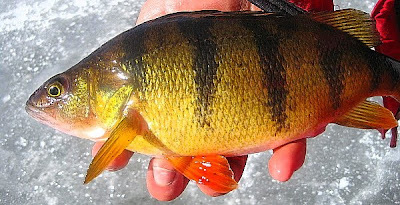 the average size was better too. 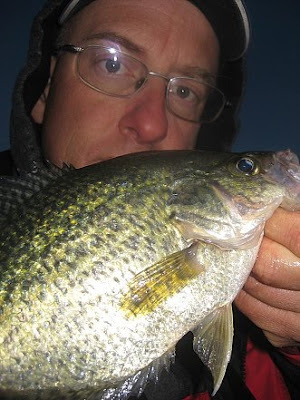 When they slowed down, we went and tried another spot that was hot last week, but the fish had moved out. Returned to the other spot only to find no fish. 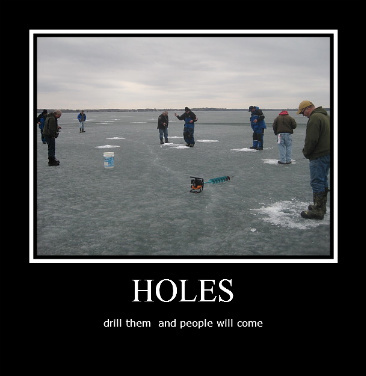 tried drilling holes in another smaller hole nearby with no sucess. 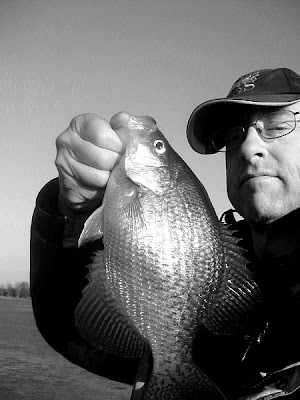 Returned to Saturdays spot to find fish still there but tight lipped, got a few there then called it a day. 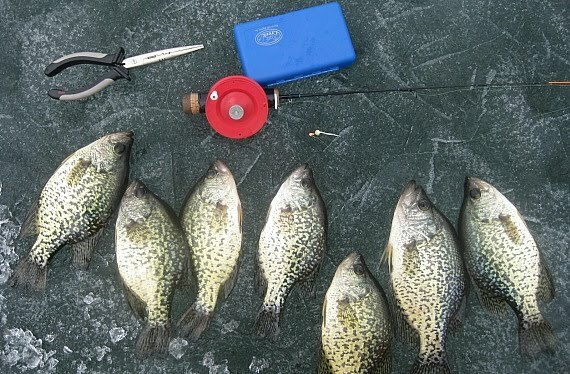 Good way to end the ice season! 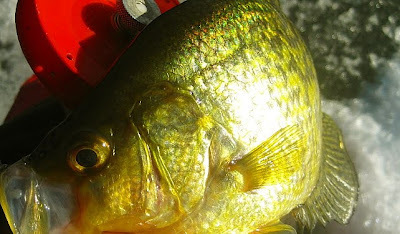 Some of the crappies got bugeyed after pulling from the depths, once we got all we wanted to keep we had to call it a day. 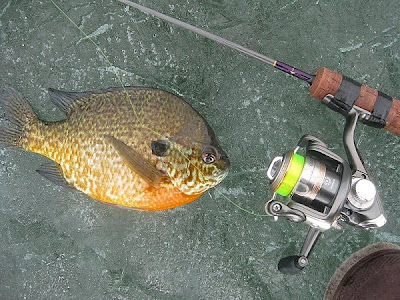 The ultimate panfish league had its last event saturday, and it was a good one. 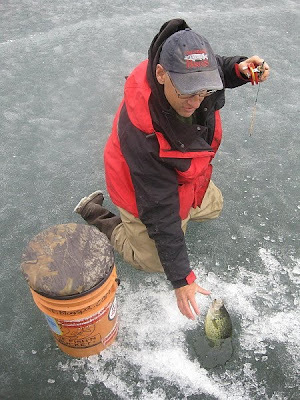 we found some good fish in one small area near the landing that were willing to bite. 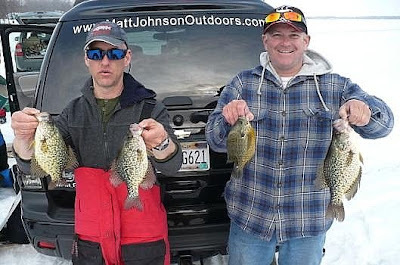 we had a couple of other areas to hit too, we thought our first spot was too small to produce enough fish, our plan was to get as many as we could and then move. 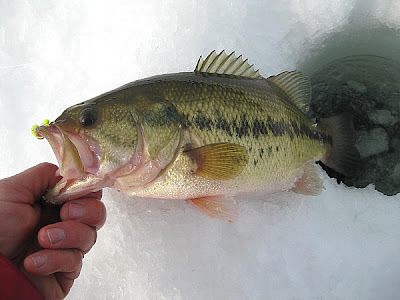 we never had to though, we got our limit of good fish there. 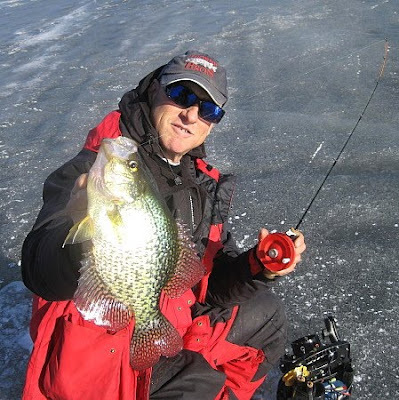 Jack iced a big slab that went 1.4# ! 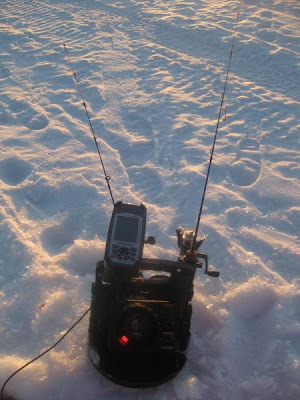 After the contest we spent the rest of the day out there and I got a few pics of some of the action sunday evening as well. 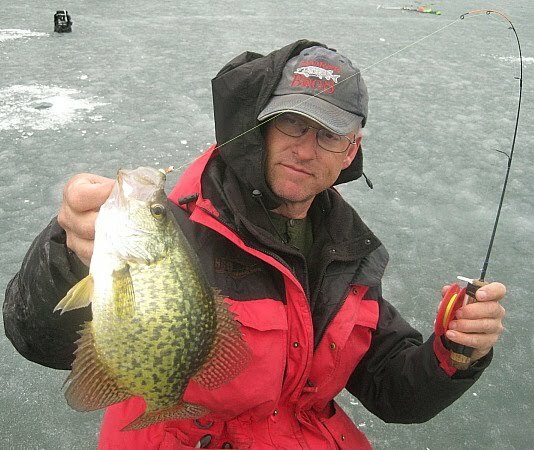 The fish were all shallow around 9 to 10 ft mostly. 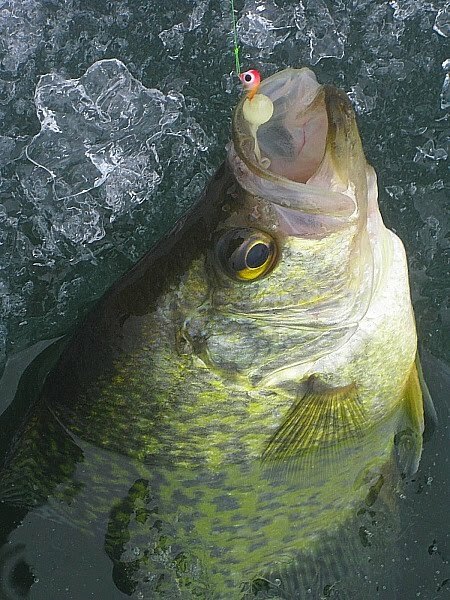 small jigs with plastic or gulp! 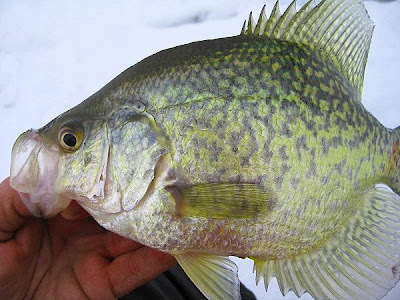 got most of them. 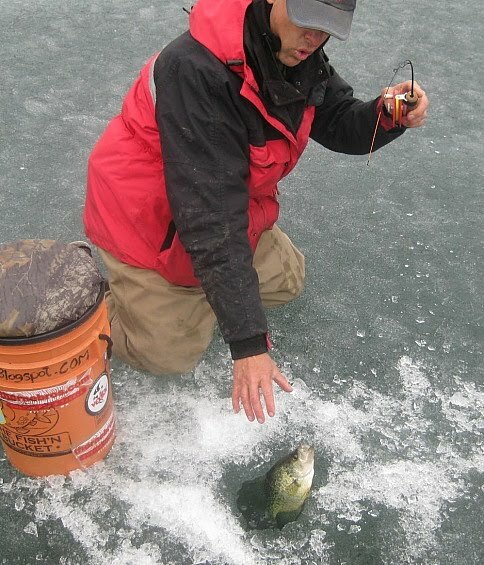 Lots of pesky bass were chasing our pannies around, we must have caught ten at least! 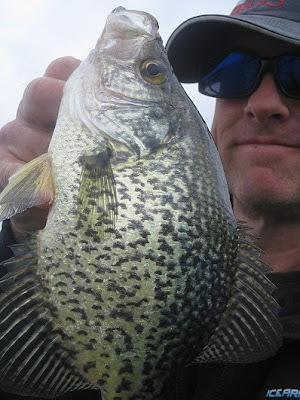 Some of our slabs, including Jacks big Mule! 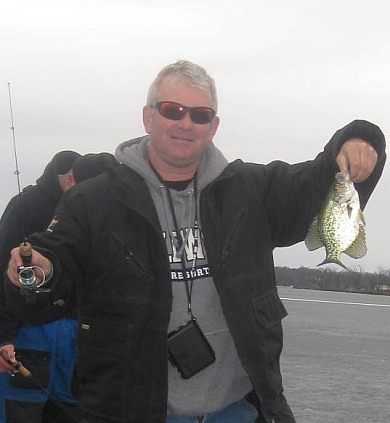 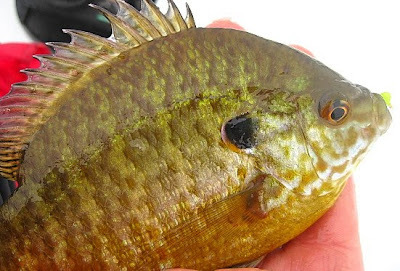 I found active panfish sunday on some north metro lakes in 9 to twelve foot of water, the sunfish were coming up off the bottom and the crappie were around 3 to 4 ft up. 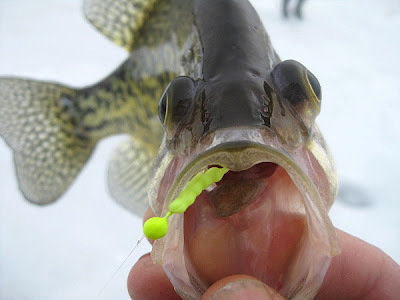 I got the crappies on a northland forage minnow spoon tipped with a gulp! 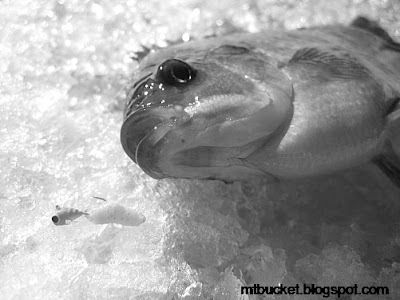 alive minnow head. 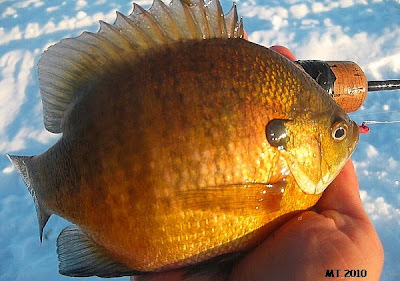 The sunfish were on a red gill getter and gulp! 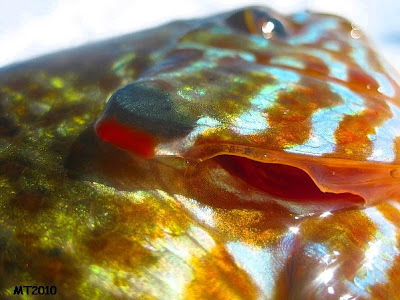 alive fishfry. 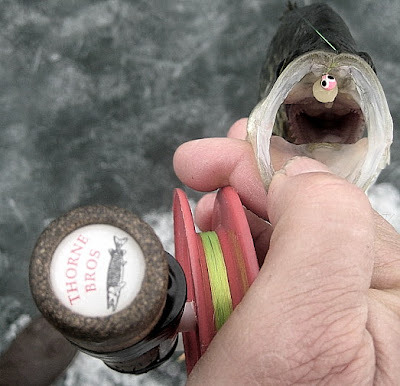 I also landed some pretty good bass, but didn't have my camera at the time.